Finally, the Penalty Box has found its postseason legs. After a lull for the past few weeks, the Penalty Box is once again operating at a fever pitch, filled to the brim with passionate hockey fans ready to express their opinions. Maybe it was the controversial topic of last week's Opening Faceoff, which looked at the races for the NHL's end of season trophies. Or perhaps, it is just that the Penalty Box community has risen its game as the playoffs approach. Whatever the reason, CTN is pleased as punch about the development. Keep up the good work, boys and girls! We'll make Crashing the Net -- and particularly the Penalty Box -- the place for passionate, knowledgeable fans to get their weekly hockey fix and discuss the game that we all love. Please join the community. Send in your thoughts to roarkeblog@nhl.com and you can find yourself in next week's Penalty Box. Remember to include your name and hometown with your e-mail. Hey, do you honestly think that (Pascal) Leclaire and (Evgeni) Nabokov deserve the Vezina more than Roberto Luongo? Ha ha! Luongo has a better save percentage than (Martin) Brodeur, more shutouts and less wins, because he has played six less games. Come on now! You write for nhl.com and you don't know what you're talking about! Also, you forgot about Alex Edler for Calder. He has played unreal this year for a depleted Vancouver defense. He is a high plus player and has gone on a tear lately. TSN has him ranked No. 1 among rookies. HOW BOUT THAT? Most of the predictions you've given for who will win what trophy I agree with, but I have one beef. What about Brodeur? He would be a great candidate for the Hart Trophy. With even a goalie as good as, say, DiPietro -- who made it to the All-Star Game -- the Devils would be struggling for a playoff spot rather than being around the No. 1 spot in the East right now. He is definitely the most valuable player to his individual team and the reason why they have been a prominent team in past years. Ovechkin would be a close second, that's true; but Brodeur should take the cake like he should've so many other times, yet was overlooked. -- Andrew Foster, Sarasota, Fla.
Andrew, Brodeur is a solid choice, even if Randy, from the previous e-mail, doesn't agree. But I still think Ovechkin has been more valuable. The Devils could still be in a playoff spot if Brodeur wasn't as good as he has been. The Capitals, however, would be battling to stay out last place, instead of trying to win the Southeast Division, if it wasn't for Ovechkin's contributions. Plus, he has done so much through his exploits and his personality to give the Washington franchise some much-needed buzz. Ovechkin simply can not be replaced. How could Ovechkin be chosen as your pick to win the Hart Trophy? He's not even in my top four. I firmly believe that the trophy should be awarded to a player that's on a playoff team. How valuable can you be to your team if you can't even make it to the playoffs? The Capitals are in the League's worst division, and AO can't lead his team to the top of it. Evgeni Malkin wins the Hart, Art Ross and Lester B. Pearson awards, just like Crosby did last year. Rob, nowhere does it say in the specs for the Hart that the player must be from a playoff team. CTN understands that it is your belief that it be the case, but it is not a necessity. CTN shares your belief in fact, just not this time. AO has been so good this year and so important to his team's fortunes that he can't be ignored. As for Malkin, he is having a stunning year – a true coming-out party – but you could convincingly fashion an argument that suggests he is not even the MVP of his team this year. Goalie Ty Conklin kept the season alive with starter Marc-Andre Fleury went out with his ankle sprain. Conklin earned points in 22 of 29 games, a 70-percent conversion rate. Poor goaltending through that stretch could have doomed the Pens, no matter what kind of heroics Malkin delivered. I just wanted to say that your trophy winner selections all look good, except for the Hart Trophy. True, Ovechkin and Nabokov should be considered, maybe even Lidstrom, but to completely ignore the play of Jarome Iginla in making this decision boggles the mind. Iginla has been one of the steadiest forwards in the NHL today and, in my opinion, has been by far the best player for the Flames this year. The Flames are in hot competition in a jam-packed, highly skilled Western Conference thanks in large part to his play. Without Jarome, the Flames are completely out of playoff contention. 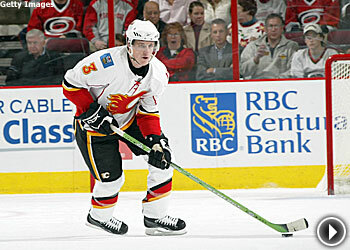 I agree with Nabokov and Ovechkin being nominees, but the heart and soul of the Calgary Flames has to take this one! Jordan, Jarome Iginla is always a solid name to throw around when discussing MVP candidates. He is one of those players that always seems to be in the mix when his team is going good. That is certainly the case this season as he leads the team in goals, points, power-play goals and time on ice by a forward. Yet, he has not been so good this year that he stands head and shoulders above the rest of the players on his team. There are other players that can be credited with Calgary's success this season and CTN just does not believe that he has had the same impact on the Flames that CTN's three finalists have had on their teams. I think Alex Kovalev should be considered for the Hart. He had a very bad year last year and he has now turned it around. He is first in goals, assists and points for Montreal. His linemates are also having very good years. Also Guy Carbonneau is coaching a team which was thought to be a long-shot for a playoff spot and, at least right now, is in first place in the East. David, CTN thinks the Jarome Iginla argument from the previous e-mail applies here. Alexei Kovalev is having a monster year – especially after taking into account last year's struggles. But he has not been head and shoulders above the other star players on his team to merit serious MVP consideration. If Kovalev were to go down for a short period, the Canadiens could survive. CTN doesn't believe that is true in the case of AO, Nabokov or Lidstrom. As for your point about Carbonneau, keep reading. What???? No mention whatsoever of Guy Carbonneau's work in Montreal? Montreal wasn't even thought to be a playoff team and today they sit first in the Eastern Conference in a tight race with Ottawa and NJ. They have the No. 1 power play and make their opponents look silly when they tic-tac-toe pass across the ice. They have no one in the top 15 of League scoring -- although Kovalev is close -- and their goaltending has been OK. This points to a total team buy-in and effort that the coaching team directs. So, how about a little consideration for Carbonneau? Stephen, politeness will get you nowhere my friend. Try some righteous indignation like the gentlemen that follow. Forget the fair exchange of ideas you attempted and just turn to belittling and antagonizing your adversary. It'll then be clear through that superiority that you know exactly what is right and what is utter tripe. When are you going to write the real column? Because the one where you pick the award winners is obviously a joke. How can you possibly discuss the Jack Adams Trophy and not even mention Guy Carbonneau? The guy is hands down the only possible winner for this award. He took a team that NOBODY had making the playoffs and has them in FIRST PLACE. He got Alex Kovalev, a player with whom he had very well-documented issues last year, and has him playing his best hockey. Brent Sutter is trailing Guy's team in the standings with a supposedly better line-up. No brainer here, Carbo is the COTY. And by the way, Andrei Markov and Mike Komisarek are both better than Zdeno Chara or Dion Phaneuf. I know you're just going to chalk this one up to me being a Montreal homer, but take the time to watch Komi and Markov and you will see they are each better than Chara or Phaneuf. Phaneuf is a sieve on D and doesn't hit anywhere near as hard as Komisarek, who at one point this year led the League in both blocked shots and hits, and isn't far off the lead at the moment. Dion Phaneuf has a good +/- rating compared to other defenseman. Ryan, CTN will deal with your Carbonneau argument below as the theme continues in the next e-mail. But before CTN moves on, let's address your points about the defensemen. CTN does think that you are looking through rouge-blue-et-blanc-tinted glasses. CTN has never made any secret of the esteem with which he holds Mike Komisarek. CTN loves the way he plays the gamer and thinks he is on the cusp of becoming an elite shut-down defenseman. But to suggest that he is a Norris Trophy candidate is sheer folly. And if you do believe that, then you have submarined your own Carbonneau for Jack Adams campaign. Because what coach in his right mind would limit a Norris Trophy candidate to a mere 21 minutes a night, the third-highest total among Montreal defensemen. Andrei Markov is having a great season, but his minus-3 rating – the sixth-worst mark among regulars on his own team – is troublesome to say the least. Markov has four more points than Phaneuf and just five more than Chara. But, both those players have significantly better plus/minus ratings and each logs more ice time than Markov. But, hey, why would we let facts find their way into a good argument, right? With all due respect, how could you not consider Guy Carbonneau of the Montreal Canadiens as a candidate for the Jack Adams? This is a team which most analysts were placing out of the playoffs prior to the season. They have no bona fide superstar and one of the youngest lineups in the League. Before Christmas, Carbonneau changed his lines more than his underwear and continuously had regular players sit out games when they played poorly. Despite all the media criticism, he kept his course and now the team is near the top of the Eastern Conference on the strength of a balanced offense (second in League scoring, seven players with 40-plus points), the League's best power play and, above all, amazing team chemistry. Not bad for a second-year coach! All in all, Montreal has had success this year based not on its players, but on its system and coaching decisions - clearly, Carbonneau deserves consideration for coach of the year. Do you agree? Eric, CTN does agree that Carbonneau deserves some consideration for the Adams, as do the three coaches CTN mentioned in last week's article. There are several other coaches that also merit consideration. 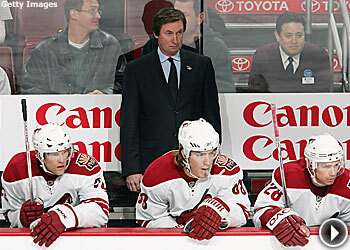 What about Wayne Gretzky in Phoenix? Ken Hitchcock in Columbus? Bruce Boudreau in Washington? Dave Tippett in Dallas? The Adams might be the hardest trophy in hockey to handicap and it is always the one pick that generates the most responses. CTN, however, does have to take you to task on one point. You say that Carbonneau has no superstars at his disposal. But it is clear from this mailbag that the Canadian coach has the Rookie of the Year, the League MVP and two Norris Trophy-caliber defensemen at his beck and call. That is a lineup that would even make Detroit's Mike Babcock jealous. Hey, I just read your article on trophies in the NHL, and I think at least the mention of one potential Calder winner was missing. You mentioned three solid players, no doubt, but what about the rookie who's just been handed the reigns in Montreal -- Carey Price? I think if he can keep Montreal as stable as the tandem of him and Cristobal Huet did, it's impossible to overlook him. Ash, Carey Price is a dark horse to win the Calder in CTN's mind, but he is certainly chasing down the leaders at an impressive clip – kind of like Curlin in the Preakness. Now that Price has the starting job, his candidacy becomes all the more legitimate. If he plays the majority of the remaining games and plays well, he will have to get some serious consideration. CTN did not include Price in the top 3 because, at the time of the writing, Price had played in less than half Montreal's games. CTN believes that it is too small a sample on which to judge a Rookie of the Year candidacy. I gotta nominate Fernando Pisani for the Masterton. After being diagnosed with ulcerative colitis, it was likely he'd never play again. After getting through the disease, he battled to regain his shape -- after losing more than 20 pounds in the hospital -- and is already back doing his thing for the Oilers. He is one of the top defensive forwards, and continues to skate well, and work diligently for his team. Plus, he racked up a respectable six points in his past eight games. I hope he seriously gets considered. Will, a sound nomination by you. The Masterton is always so hard to nail down because there are so many worthy candidates. But Pisani is one CTN shamefully did overlook. He is having a solid season after battling through a good deal of adversity. He should be honored for his efforts so CTN is happy you brought it up. Sigh. Why do I have to keep reminding everyone that my old college buddy -- Marty St. Louis -- is by-and-far the most gentlemanly player in the world? Hardly any penalty minutes -- which is amazing considering he plays the most minutes per game of any forward -- never a bad word to the refs, opposing players or fans, and not a single kid left in line waiting for an autograph. Yet he doesn't even garner a mention from you. Sami Kapanen? C'mon. Several major penalties and two game misconducts does not equal the Lady Byng. If you've ever had a chance to hang out with Marty, which I've had the benefit of, you would realize there's not anyone more sincere and dedicated to the game of hockey; and who demonstrates night after night how to play the game the way it was meant to be played. While I'm on the topic of former University of Vermont Catamounts, how about a little consideration for Tim Thomas? If not for the Vezina, then how about the Hart? If you haven't noticed this season, the Bruins are pretty good, way better than they were projected. And his 40-plus saves per night on a consistent basis -- many of them the most acrobatic you'll ever see -- are the main reason why. No bones with the rest of your picks, however; well said. Coby, that was an eloquent speech on the merits of Marty St. Louis' candidacy for the Lady Byng. CTN is sure that Sami Kapanen would surely withdraw from the contest to let St. Louis have the trophy. Unfortunately, the Lady Byng is not a much-coveted trophy among NHL players. But, there is no denying that Martin St. Louis is one of the genuine good guys in the game. And, Tim Thomas is having a magical season, for sure. CTN just isn't comfortable with advocating him for either award. CTN would argue that Marc Savard and Zdeno Chara have been as valuable as Tim Thomas when it comes to the Bruins' success. And his lackluster victory total – less than half the number of Evgeni Nabokov and Marty Brodeur – and pedestrian goals-against average are problematic in his Vezina candidacy. But his save percentage is quite impressive and, as you suggest, he is among the most entertaining goalies out there to watch on a nightly basis. He's got a little Ron Tugnutt in him and CTN means that as a compliment of the highest order. *No love for Pascal Leclaire? He has dominance in shutouts, fluctuates between third and fourth in GAA, and fluctuates between second and fourth in save percentage. Couple that with the fact that his squad is virtually useless in its own end, and you have a stellar goaltender. Potentially the best in the League -- for this year at least. *No arguments with your Art Ross and Maurice Richard predictions, however, your Frank J. Selke pick of Pavel Datsyuk I found slightly odd. When I first saw his picture, I immediately thought of his dynamic offensive play, especially with linemate and fellow offensive genius Henrik Zetterberg. While he's certainly no slouch in his own end, I would like to contest the fact that he's the best in his own end. You mentioned John Madden, which I agree with completely. The Frank J. Selke is a bit of a subjective trophy; you can ask a 100 different people and come up with thirty-plus answers. However, I personally believe Ryan Getzlaf has a shot at it. His dynamic defensive play is part of the reason why Anaheim was still a contender before veteran Scott Niedermayer rejoined the lineup. And while he certainly won't win the Frank J. Selke, I'm quite happy to see that Jaromir Jagr is dominating the defensive side of the game, too. He's usually (rightfully so) seen as one of the greatest offensive players in history, so it's nice to see that he can play both ends of the ice. And considering Alexander Ovechkin's epic empty-net heroics, as well as his intense physical play, he might be a candidate someday, if he isn't already. *The Norris to Lidstrom, no arguments there. How could there be? However, I look forward to seeing Lidstrom's retirement. Not because I have anything against Lidstrom. If anything, the opposite is true. I have vast respect for any player that can dominate the defensive and offensive aspects of the game like Lidstrom. I'm simply anticipating an era where the Norris is fought over again. Some future Norris winners that I can see include Zdeno Chara, Brian Campbell, Mike Green, Dion Phaneuf, and, who knows, maybe even Tobias Enstrom. And an argument can definitely be made in favor of Anton Volchenkov, a rugged defensive defenseman who, in my opinion, doesn't get the credit he deserves -- he's one of the best goaltenders in the League, and he skates. *Not even a single mention of Jonathan Toews in your "Calder" section? 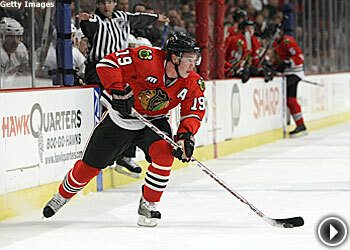 Toews is spectacular in any situation. He can dangle very well, his passing is tight and efficient, and he can put the puck in the net. Couple that with good leadership, and you have an extremely dynamic player dangerous anywhere on the ice. He's certainly a huge reason why Kane's numbers are so good, and vice versa. *And onto the Hart. While I am indeed a big fan of Alexander Ovechkin, the Hart just as easily could go to Daniel Alfredsson, who is having an amazing season on an Ottawa team that's largely dropped the ball after their 15-2 start, Evgeni Malkin, who has stepped up to the plate after his (largely overrated) linemate Sidney Crosby is injured, Vincent Lecavalier, who's been the only star in an otherwise black sky in Tampa Bay, or even (though I doubt it) Mats Sundin. The Toronto captain is fairly low on the leader board when compared to Malkin, Ovechkin and Alfredsson, however he is in my opinion he is the sole reason for the Toronto turnaround we are witnessing. If you compare the shoddy play of Toronto before he announced his no-trade-clause decision, and the playoff-hungry play after he stood firm, you have a potential Hart Trophy right there. *Lester B. Pearson award? While I have no doubt that this would go to Ovechkin or Malkin, you didn't even mention it in your article. Just a few thoughts. I look forward, as always, to next week's column. Alex, that's certainly a mouthful of cogent points. Let's address them last-to-first. CTN did not pick the Pearson because it is voted on by the players. CTN would never speak for the players. Your Hart suggestions are a little esoteric, but interesting. CTN would never advance Sundin. He has had a great year, but Toronto couldn't be much worse with him out of the lineup. The same goes for Lecavalier in Tampa Bay. CTN can't imagine any situation in which Crosby would be considered overrated, so CTN has trouble following your Malkin argument. As for Alfredsson, he is the linchpin of that team, but Ottawa's second-half slide derails his campaign. Plus, the presence of Jason Spezza and Dany Heatley hurts his platform. Toews has been great in Chicago. He will be the team's next captain and he will be a great one. Most likely, his career will follow a path very similar to Steve Yzerman's. But, Toews did miss 18 games already this season and, in CTN's eyes, that is a negative in his candidacy. Volchenkov is one of CTN's favorite defensemen. But, he is not having a good season. The Selke is a subjective award, as you suggest. But, CTN urges you to watch Datsyuk in the neutral zone and the first 20 feet of his own end to see just how special he is defensively. He can strip virtually any player of the puck. Finally, Leclaire got some love from CTN. Leclaire was one of the runners-up to Brodeur in CTN's Vezina selections. Just wanted to get your opinion on the recent Red Wings' slump. Do you think it's related to their injury-riddled defense or are other teams beginning to work out their style of play and countering it? Rohan, CTN doesn't think you can fully judge the Red Wings' struggles until they get healthy. This team has been just decimated with injuries. Not even Hawkeye Pierce and Trapper John could handle the triage this team has undergone in the last month. Forget a No. 7 D-man, coach Mike Babcock is down to No. 10 on the depth chart. For a team that generates so much offense from the back, the blue-line injuries have been disastrous. But, the club is starting to get healthy and the wins should return. The true test that awaits Detroit is how effective will all-everything D man Lidstrom be when he returns from his injury? Here in Vancouver, Roberto Luongo finally stopped being the polite, friendly hockey player and ripped into his defensemen after they played Colorado last Wednesday. He had every right to get mad at them -- they have been inconsistent for a little while now, and their down-low coverage was awful. Luongo is one of the leaders on the Canucks, and for a while now, local reporters have mentioned that if goalies could be a team captains, Luongo would get serious consideration in Vancouver. Why are goalies not made captains in the NHL? Tradition? I believe that they used to be captains, but I couldn't remember where I heard that, or if it was true. What other goalies around the League do you see being leaders in their locker rooms? A great question and a great point about Luongo becoming more forceful by you, Josh. At one point, goalies were allowed to be team captains, but only a few ever were at the NHL level, including George Hainsworth of the Montreal Canadiens. Today, they are no longer allowed to be a captain or alternate because it would be too cumbersome to have the goalies skate to the referee every time a play or decision needed to be discussed, which is the primary job for the captain and his alternates. If that rule were lifted, however, there would be several goalies that would be in line for as letter. Just off the top of the head, CTN can think of five potential captains: Luongo, Marty Brodeur in New Jersey, Rick DiPietro with the Isles, Ryan Miller in Buffalo and Marty Turco in Dallas. You've probably heard by now, it's Portuguese, not Spanish back-up vocals on “Should I Stay or Should I Go.” Old punks don't die, they just get better clothing. Wow, someone else in hockey who loves and understands the Clash. Gotta say, though, London Calling, Train in Vain or Rock the Casbah are as popular, though the Mick Jones song you quoted fit your article perfectly. Personally, White Man in Hammersmith Palais, Complete Control, Straight To Hell, Safe European Home or anything off London Calling is better. Great article. I appreciate the Clash reference. Mick, thanks for the compliment. Should I Stay or Should I Go is their most popular song – at least commercially. It is the band's only No. 1 hit. Personally, CTN is partial to White Riot, Lost in the Supermarket, Sean Flynn, Straight to Hell and This is England are essential Clash listens. But, the whole catalogue is fantastic. And, at its core – like all punk – it is the perfect soundtrack for hockey.